Each month, our print newsletter Distribution Center Management provides in-depth information and ideas to help readers better manage the warehouse or distribution center. But we often have valuable background material, additional information, or related resources that we just cant fit in the newsletter. Listed below are a wide range of documents that add further insight and understanding to the articles in Distribution Center Management. Learn more about the Distribution Center Management newsletter. Wal-Mart implements run-hide-fight response at DCs — After a rash of DC shootings in 2014, its wise to think about how you might respond to a violent incident in 2015. Watch the FBIs video: Run. Hide. Fight. Surviving an Active Shooter Event. To keep beans from passing sell-by date, Starbucks focuses on inventory rotation — For a company that moves as much product as Starbucks, even the occasional out-of-order picks can add up fast. Exceptions raise the risk that coffee beans or tea will reach their expiration date while theyre still in the warehouse or on the shelf of a coffeeshop. Click here to listen to the Starbucks presentation at the 2014 WERC conference. Triple con supply chain could be the wave of the future — As disruptive companies from Amazon to Zappos change the way we do business, its only logical to assume that supply chains will morph, too. Jeroen van den Berg, director of logistics software company Storelink, foresees the rise of the triple con supply chain that follows three principles. See his diagram of the triple con supply chain here. OSHA broadens reporting requirements for workplace injuries — In a bid to keep a closer eye on workplace injuries, the Occupational Safety and Health Administration (OSHA) will introduce stricter rules for what injuries must be reported. Click to view an OSHA Fact Sheet. Amid spike in workplace violence, cops urge Run-Hide-Fight plan — Two deadly incidents a few days apart underscore a troubling trend in workplace violence. In a report released the week of those two tragedies, the FBI concluded mass shootings have risen over the past decade. Research by Distribution Center Management finds that distribution centers have been the site of an unsettling number of ugly episodes. See the FBIs report on mass shootings and the Department of Homeland Securitys Run-Hide-Fight instructions. In hot distribution markets, supply of space dries up — As the economy rebounds, the supply of distribution space is dwindling in many parts of the country. Click to see brokerage Jones Lang LaSalles latest report on warehouse vacancies and rents. As engineered labor standards, and incentives become more common, heres how to get started — During this years Modex conference, Peter Schnorbach of Manhattan Associates outlined the four phases of labor management systems. Click to view his PowerPoint presentation. Activity throughout the day boosts energy, improves management — Experts say you should schedule short bursts of activity into your day. As an added bonus, your facility will reap the benefits of Management by Walking Around. See Tom Tanels tips on what to do while youre walking. Increase staff retention — Conducting an exit interview with departing employees can yield information that can be used to target problem areas. See a sample exit interview. Put wall systems: Why they work for piece-pick operations — If you are looking to boost your piece-pick operation, Ken Ruehrdanz of Dematic suggests a put wall system. See how the put wall works in this video. To communicate more effectively, stop hiding behind the e-wall — Email and text messaging are efficient forms of communication — but theyre not always the most effective way to perform your management duties. See Chris Helders presentation at the WERC conference. Smart glasses promise next advancement in warehouse productivity — Smart glasses maker Vuzix and enterprise software firm SAP have been marketing an augmented reality offering designed for DCs. A video demonstration created by the two companies poses tantalizing possibilities. DC shooting reminds managers to look out for warning signs of violence — To learn more about recognizing the signs of violence read this archive article. How Vested Outsourcing yielded a win for Dells returns DC — For seven years, before they discovered a kinder and gentler approach to doing business, computer maker Dell and third-party logistics provider Genco ATC had a typically hard-nosed relationship. Vested outsourcing proved to be a win-win for companies. Click for a quick overview of vested outsourcing. Snack maker learns lessons from automation project — Snack maker Snyders-Lance had an old-school approach to automation. Operating from a 1950s facility in Charlotte, NC, the company relied on workers to handle many of its processes. Last year, the company implemented a $5.9 million robotics project that automated its palletizing. Click to see a PowerPoint presentation on the automation project. Five keys to getting the most value from SCO software — Optricity Corp. CEO Dan Basmajian provides five criteria for ensuring SCO software projects bring the best results. Two of the reports that he discusses are shown here. See examples of a slotting visualization and an ROI calculation. As more DCs hire disabled workers, flexibility is key — Beth Hammond, director of training at VIP Solutions, once struggled to get big companies to agree to place disabled workers in their DCs. Now, though, Hammond says companies are calling her to ask for employees. See an archive article covering advice for hiring disabled workers in any DC. Online sales leads to new generation of super-sized DCs — Spurred by an improving economy and a spike in online sales, distribution real estate is seeing a spike in demand, according to research by commercial real estate brokerage Cushman & Wakefield. See their Industrial Real Estate Forecast. Nontraditional aisle layouts could boost efficiency in some types of DCs, researchers say — Tweaking aisles into V shapes or even zigzags can cut travel times by as much as 12 percent, according to new research by Omer Ozturkoglu of Yasar University in Turkey, Kevin Gue of Auburn University, and Russell Meller of the University of Arkansas.See coverage of earlier research into aisle design and Generacs experience with the fishbone layout. New packing material promises better protection, more green credibility — Forget foam, packing peanuts, air pillows, or bubble wrap. The maker of a new packing material made of cardboard says its solution offers more protection, lower cost, and fewer environmental impacts. The material, known as ExpandOS, uses strips of cardboard folded into triangles to protect fragile items. See a video showing ExpandOS in use. Staples uses custom packaging to cut wasted space in orders — Place an order for a few reams of paper and a box of pens on Staples website, and the retailer immediately will get to work on creating a customized shipping package, one that minimizes wasted space. Amazon eyes Post Office, drones as it expands its delivery system — As Amazon continues to reshape the logistics industry, the online retailer has launched two initiatives that are sure to prove disruptive. See Amazon unveil its delivery drones on 60 Minutes. Workplace parties, breaks during busy times help Container Store DC attract good workers — One month, theres a chili cook-off combined with a costume contest. Another month its a luau. At Thanksgiving, The Container Store DC workers stage a bowling match using frozen turkeys as balls. The highlight of the year might be Derby Day, when employees divide into teams to build cars inspired by the Boy Scouts Pinewood Derby. If your DC doesnt look like this, it may be time for a change. Lessons from online grocers new DC: Balance high-tech and low-tech for just right — See Paul Huppertzs presentation about Peapods material handling project. Plastic pallet provider touted benefits but files for bankruptcy — When it launched in 2006, plastic pallet provider iGPS promised a better alternative to traditional wood pallets. But for all its potential, the plastic pallet market has fallen on hard times. Read the companys bankruptcy filing. Fans can dry out sweating slab syndrome — The October issue of Distribution Center Management provides an example of how sweating slab syndrome was minimized at the N.B. Handy distribution center. Here are additional details on how to remedy this situation from an archival article at Concrete Construction Online. Voice picking helps grocers trace fruits and veggies — With new produce traceability rules taking effect this month, voice picking systems boast a new feature — the ability for food distributors to follow fruits and vegetables through the supply chain. See a white paper illustrating produce traceability. Planning, research key to investments in new DC technology — When W.W. Grainger opened its new 1 million-square foot DC, it sported state-of-the-art automation. The October issue of Distribution Center Management shares valuable lessons learned from their automation investments. Here are photos of some of the new equipment. Real estate market tightens for distribution space — The national vacancy rate for industrial space fell to 8.4 percent in the second quarter from 9.2 percent a year earlier, according to a report by commercial real estate firm Newmark Grubb Knight Frank. Highlights of the report appear in the September issue of Distribution Center Management. Read the full report here. Custom storage containers help auto parts DC maximize space — With its business booming, auto parts supplier PK USA faced the costly decision to expand its warehouse in Shelbyville, IN. Instead, the company found a cheaper and easier solution: Custom storage containers that make efficient use of space. Click to see the custom containers. Automated alerts, vetting small carriers latest tactics for thwarting cargo crime — A string of high-profile arrests has put a dent in cargo crime, but that doesnt mean the threat is gone. The August issue of Distribution Center Management provided a summary of highlights from Schneider Nationals white paper on cargo security. Read Keeping Your Cargo Safe here. Old-fashioned thinking with new technology a common mistake in DCs — Howard Coleman of MCA Associates shares his list of the top 10 DC mistakes in this months issue of Distribution Center Management. Kate Vitasek of Supply Chain Visions has also tackled this topic. Read her list of dumb things DCs do. Fox motocross DC goes from Dark Ages to post-modern times, sees big productivity boost — This case study in the July issue of Distribution Center Management sees Fox Head Inc. move from paper picking to a WMS with a voice-picking system. The result is shorter training times, fewer errors, and higher productivity. See a video about Fox Heads use of voice picking. Food-to-energy system powers supermarket DC — For many distribution centers, going green means installing solar panels on the roof. Some create eco-friendly power with windmills. While those green initiatives have become commonplace, a supermarket DC in California is trying something new — a power plant that turns spoiled food into electricity. See a video explaining Krogers new biomass plant. Stores as DCs? 3-D printing? Retail supply chain could see major changes — See Jones Lang LaSalles video presentation about changes to retail distribution. Bed bugs arent a menace just for homes and hotels any more — Bed bugs are the biggest pest-related nuisance DCs face at the moment. Particularly at risk are DCs that handle returns of clothes and furniture. The June issue discusses best practices to avoid infestation. Here you may view photos of the telltale signs of bed bugs. Workers prefer 10-hour shifts, survey finds — Warehouse workers increasingly want 10-hour work days rather than eight-hour shifts, according to a new survey by staffing firm ProLogistix. See the full 2013 Warehouse Employee Opinion Survey Results here. In exchange for hefty investment, LED lights yield big savings — The May issue of Distribution Center Management covers Murphy Logistics move to LED Lights. A prior effort saw the installation of prarie grass and solar panels. Read the article Prairie grasses, solar panels yield big savings for DC operator. Sears DCs use DOMS to gain new insight into inventory — Sears Home Services had five distribution centers, yet there was no inventory visibility from one location to another. The May issue covers the implementation of a distributed order management system (DOMS) that tracks inventory across DCs and even inside thousands of trucks driven by technicians. See also a PowerPoint presentation by Eric Gasmann, director of parts supply chain network for Sears. DC thieves used confidential documents from ADT as map, insurer says — Coverage of this case shows holes in DC protection. And, while you may not be able to stop a thief who has insider information, in many cases rings of protection can help. Read the article To secure your facility, create layers of protection. When installing new racks, be sure to ask the right questions — The April issue of Distribution Center Management offers several ways to avoid delays, headaches, and safety problems when installing new racks. Youll also find these important rack-maintenance tips helpful. E-commerce fulfillment changes face of DCs — The same-day delivery craze that started with Amazon is remaking distribution centers. Learn how new requirements are shaping DCs in the Big-Box Outlook from Jones Lang LaSalle. Robotics, forklift monitoring are on cusp of major technical advancements — For warehouse managers seeking to improve productivity and safety, theres an ever-widening array of high-tech choices. Two recent entrants are a robotic truck unloader and a new breed of forklift monitoring devices. Both technologies were covered in the March issue of Distribution Center Management. Here we present video of Wynrights Robotic Truck UNloader in action. Flu outbreak reminds managers of importance of vaccinations, handwashing — A nationwide flu outbreak has taken a bite out of productivity this winter — and the public health challenge underscores the need for taking commonsense steps to contain the spread of the illness. The CDC provides two flu-related safety posters, which you may print and use in your break room. Want a hard-nosed way to get a handle on inventory? — Jon Schriebfeder of Effective Inventory Management says to link worker pay to inventory accuracy. Theres no surer way to remind workers that everyone plays an important role in the success of the operation — and to turn your workers into a pack of inventory watchdogs. In the February issue of Distribution Center Managment, Schriebfeder shows how to implement a successful compensation program tied to cycle counting. Heres more on how to implement cycle counting. If a worker voices safety concerns, take it seriously or risk running afoul of whistleblower rules — The Occupational Safety and Health Administration (OSHA) has stepped-up its focus on protecting workplace whistleblowers. This months article provides advice for staying on the right side of OSHAs whistleblower efforts. And this OSHA Fact Sheet explains protections to employees. As green initiatives take off, one DC installs a windmill, another sends no waste to the landfill — Warehouses are notorious energy hogs, and with oil prices high, DCs can save big money by running with less power. One option the consultant we interviewed this month didnt like is wind power. But, Other World Computing disagrees. Read more about Other Worlds wind turbine and other green initiatives. Creating a lean road map helps distributor reduce waste, cut overtime — As part of its warehouse revamp, Immucor replaced its spaghetti layout with four distinct conveyor lines. And reworked the warehouse so that the fastest-moving SKUs could be reached with fewer steps. As a result, Immucor was able to reduce walking time by 90 percent. Here are before and after diagrams of the Immucor warehouse. The secrets of best-in-class DCs — Jeroen van den Berg shares the results of his research on the best practices of distribution center and warehouse operations. As green initiatives take off, one DC installs a windmill, another sends no waste to the landfill — Other World Computing uses bioswales, gently sloped areas designed to collect silt and other rainwater runoff and slow the flow of water, and a parking lot with brick pavers that allow rain water to flow through the parking surface and then be filtered by several layers of rocks and gravel before it returns to the underground watershed. See the diagrams here. Logistics costs rise as trucking squeeze looms — Read CSCMPs 23rd Annual State of Logistics Report. What do workers want? More pay tops list — In recent years, human resources experts have stressed that pay isnt the only way — or even the most important way — to keep workers happy. But for frontline workers in DCs, its all about pay. Thats according to research by Brian Devine, division vice president at staffing firm ProLogistix. View the rankings of worker priorities here. What a leader must know to be successful — How does your attitude affect your employees? To find out, complete this self-learning exercise from Tom Tanel of CATTAN Services Group. Cycle counting improves accuracy, study finds — Companies with a cycle counting program average 98 percent inventory accuracy, according to a survey by the Tompkins Supply Chain Consortium. Read the full Cycle Counting report. 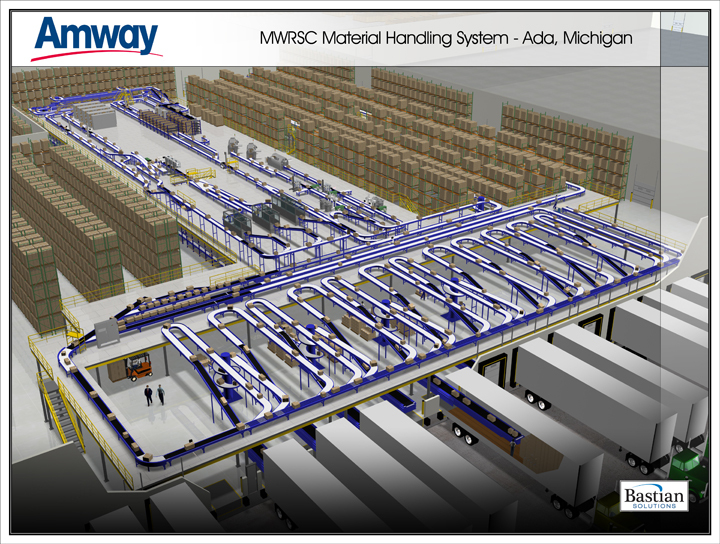 Custom-built boxes among innovations at new Amway DC — Some of the latest and greatest material handling technology is on display at Amways new distribution center in Ada, MI. Click to view packaging devices, voice pick technology and a diagram of the DC, note the conveyor in the trucks. For a safer DC, consider four safety truths — After examining data from a variety of employers, Predictive Solutions, a workplace safety firm, has identified four strategies for improving safety. Read the white paper Predictive Analytics in Workplace Safety. Criticism of warehouse working conditions mounts — Industry group calls grocer a leader in workplace safety. View Richard Schulers PowerPoint presentation, Best-in-Class Safety Program: How to Protect Your Most Valuable Assets. Without supply chain homework, mergers can fail — Supply chain due diligence is vital when considering a merger or acquisition, according to Tompkins International. Far too often, M&A fails due to lack of synergy, related party conflicts, clashing cultures, or information technology issues. To learn more read the white paper Laying the Foundation for Successful M&A. Get out of fire-fighting mode and improve your operations — With all the talk of high-tech efficiency measures, it would be easy to assume that most distribution centers operate efficiently and effectively. But such an assumption would be wrong, says Jeroen P. van den Berg, head of Dutch firm Jeroen van den Berg Consulting and author of the new book Highly Competitive Warehouse Management. Read van den Bergs white paper A Growth Path for Warehouse Optimization. Fuel costs promise to remake distribution patterns, real estate experts say — Shenzhens fast ascent from backwater to distribution hub illustrates how quickly economic forces can change the geography of supply chains. And its the sort of example Sam Foster of Jones Lang LaSalle points to when he predicts that the United States distribution patterns are poised to change. Read the Jones Lang LaSalle report on changing patterns and emerging hubs. For order-picking warehouses, multiple cross aisles can boost efficiency — To help DCs decide how best to lay out their facilities, Kees Jan Roodbergen of the University of Groningen in the Netherlands designed an online tool thats available at www.roodbergen.com/warehouse/index.php. Also click to read his white paper on picking layout. Looking for a more efficient warehouse layout? Maybe the Flying V, fishbone, or chevron are for you — Kevin Gue and Russ Meller have teamed up to question the assumptions behind the traditional warehouse layout, and theyve found that modifying the layouts can cut travel times by as much as 20 percent. See alternate layouts from Gue and Meller. Five reasons WMS in the cloud might work for you — See HighJump Softwares WMS in the cloud white paper. Is it time to modernize? Instead of moving, DCs decide to upgrade, overhaul — Many companies are choosing to squeeze as much as they can from their existing warehouses and equipment rather than moving to larger or more modern facilities. To do this, they are tackling process improvements and engineering modifications as well as maintaining and rebuilding existing equipment rather than replacing it. Ken Ruehrdanz of Dematic Corp. provides a useful modernization checklist. Electric lift trucks much cheaper than propane trucks, and some laggards make the switch — Electric lift trucks are the dominant type of forklift used in distribution centers, with a small number using liquid propane (LP) trucks. DCs looking to reduce operating costs would be wise to replace their LP trucks with electric, says Carl Modesette of Cat Lift Trucks. See Modesettes white paper Choosing Electric Lift Trucks Over Internal Combustion. Real estate market still favors tenants in most U.S. cities — Despite a slight uptick in demand for distribution space, the market remains soft. For DC operators looking to lease new space or to renegotiate terms on current space, the outlook is favorable. To read the complete Spring 2011 Jones Lang LaSalle industrial real estate report for North America, click here. Find untapped savings by improving operations in your battery rooms — Inefficient use of forklift batteries costs the materials handling industry an estimated $260 million a year. Click here to see Harold Vanasses tips for running a lean battery operation. Logistics costs spike, trucking shortage looms, CSCMP study finds — According to the Council of Supply Chain Management Professionals 22nd Annual State of Logistics Report, business logistics costs rose to 8.3 percent of U.S. gross domestic product in 2010, up from 7.7 percent in 2009. Read the full report now. Tips for preventing cargo theft — The May theft of a trailer-load of Pfizer drugs in Memphis was just one more example of the growth industry in cargo theft, which exacts a $30 billion a year toll. Read the National Insurance Crime Bureau report on reducing theft. Cross-docking gains popularity in difficult economy — Cross-docking isnt new, but its gaining newfound interest from companies that want to shorten their shipping cycles, rein in inventory carrying costs, and deliver just-in-time service — all without making a big investment. Learn about common practices, biggest challenges, and emerging trends in cross-docking in this while paper from 3PL Saddle Creek. Cross-training, communication among simple steps for creating worker-centric warehouse — The worker-centric warehouse movement started at the end of the economic boom, when low unemployment rates forced DC managers to think about how to attract and keep workers. Read Kevin Gues manifesto on worker-centric warehouses. Trucking company says vigilance, communication key to thwarting thieves — By all accounts, cargo theft is a growth industry. Yet trucking company Schneider National says it managed to cut theft in 2010. A recent white paper explains how. DCs with automation are satisfied, but cost remains a barrier — Fully 86 percent of warehouses and DCs that have automated material handling are satisfied with their systems, according to a survey by the Integrated Systems and Controls Council of the Material Handling Industry of America. Read the full survey here. Inexpensive software leads to more efficient delivery schedules — See additional information on how Appointment-Plus streamlined Georgia-Pacifics scheduling. Boost efficiency by reworking existing buildings — In this PowerPoint presentation, Sport Supply Group and TranSystems explain how they boosted efficiency at a cramped facility without an expensive relocation. WERC certification — See a sample audit from WERCs new Warehouse Certification Program. Racking Up Savings with the Right Slotting Strategy — KOM International offers tips for making the most of a reslot in this white paper. The Boyd Co.s annual DC cost report — Millions of dollars a year in operating expenses separate North Americas priciest and cheapest places to run a distribution center. Read a summary of the report. Are you prepared for the supply chain talent crisis? — Read the MIT white paper. Energy-Efficient Lighting Guide — Arizona Public Service created this useful guide to the full range of lighting types and money saving options for commercial buildings. A new generation of picking tools promises more productivity and fewer injuries — See the EcoPick, Vaculex Vacuum Picker, and Destuffer. Grant Thorntons annual supply chain survey — The supply chain industry expects profits to improve in 2011. Read the full report, The supply chain today: Achieving efficiencies, managing uncertainties. Rooftop Solar Plant Photos — Warehouse landlord Heller Industrial Parks has gone on a solar building spree in New Jersey. The company produces 1.5 megawatts of solar power at its 8.5 million-square-foot facility in Edison Park. Rooftop Revenue — Read the research report from the National Association of Industrial and Office Properties Research Foundation. Supply Chain Information Sharing and Analysis report — View the full report, which includes data on thieves targeting empty tractor-trailers to be used later in cargo theft. As marijuana harvest season approaches, keep an eye out for shipments of illicit drugs — An archive article from Distribution Center Management. Crowd Engineering — Old-style time and motion studies continue to have a role in the DC and warehouse as this article from Steve Mulaik shows. Going Green While Watching the Bottom Line — A case study from United Natural Foods. Annual Survey of Third-Party Logistics — CEOs involved in this years survey are more optimistic about growth prospects than they were last year, but appear to be more cautious about how growth will be achieved. Tabletop Disaster Test — The Small Business Administration encourages planning for emergencies and testing those plans with a tabletop drill. National Industrial Index — Warehouse rental rates will slide in 2010, while vacancy rates will rise, says commercial real estate brokerage Marcus & Millichap. Safety Postcards — At UniFirst Corp. safety is a 24/7 job. So workers receive safety postcards at their homes. Some cover work-related topics, others focus on general safety. Efficient Packaging — The right packaging can help your organization go green and lean. Terry Harris of Chicago Consulting explains how. Cargo Theft Report — What are thieves favorite targets? This report by LoJack Supply Chain Integrity and the Supply Chain Information Sharing and Analysis Center gives the rundown for the first nine months of 2009. Operating Costs — The Boyd Co. ranks dozens of markets based on the costs of running a 450,000-square-foot DC. San Francisco is the priciest, while Jackson, MS, is the cheapest. See where other markets rank. Retail Supply Chain — See the Retail Industry Leadership Associations report on managing costs in the supply chain. West Coast Diversion — Slowly but surely, imports are arriving through the East Coast and Gulf Coast rather than the West Coast. See Grubb & Ellis chart illustrating this trend. Go Green Sources — Before the economy took a turn in late 2008, green initiatives were all the rage. And while sustainability hasnt dropped off the radar yet, most companies are looking for initiatives that are both green and help reduce costs at the same time. According to Lou Cerny, a vice president at consulting firm Sedlak, changes to exit signs, urinals and cartons can make a difference. The Worker-Centric Warehouse — Sponsored by the Material Handling Industry of America, Dr. Kevin Gue and his associates are conducting a survey of warehouse workers to determine their level of satisfaction in different areas. Read their manifesto here. Walgreens Anderson, SC, DC — 30 percent of the workforce at a Walgreens DC in Anderson, SC, is made up of people with disabilities. These employees have been trained to work side-by-side with other team members, with the same productivity goals, earning the same pay. Watch a video of the Anderson, SC, DC in action here. Conveyor Safety Poster (PDF document courtesy of Cisco-Eagle and Hytrol Conveyors): This printable poster can be posted in break rooms and conveyor area to reinforce training. Conveyor Safety Manual (PDF document): Printable conveyor safety standards from Cisco-Eagle and Hytrol Conveyors, Inc.
Conveyor Safety Tips from The U.S. Department of Labor. Some tips on belt conveyor safety. Concepts and Techniques of Machine Guarding. Information from OSHA on machine guarding techniques. Forklift Accident Brings Down The Warehouse Video — Need another reason to implement forklift safety procedures in the DC? Watch this YouTube footage of a forklift accident that literally brings the warehouse down. Green Roofs — Is a green roof right for your DC? This article by Tecta Americas Mark Gaulin can help you decide. Rubber Pallet Bands — U.S. Foodservice-Fort Mills DC was able to save $8,000 in five months by replacing shrink wrap with rubber pallet bands. The DC has also seen a reduction of more than 100,000 pounds of shrink wrap per year. Here is a list of some of the many manufacturers and distributors of rubber pallet bands. Inventory Management Seminars — These seminars, led by the Distribution Teams Jason Bader, teach more than 30 different hunting for cash ideas that DC managers can implement immediately. All aspects of purchasing, inventory management, warehouse operations, branch operations, receiving and put away, cycle counting, dead stock management, and distribution industry technology are covered. To learn more about these seminars, visit The Distribution Teams website. Is Fear of Benchmarking Costing you Money? — Consultant Debra Ellis says one of the best ways to identify inefficiencies in your picking process is to implement a benchmarking system. But if the idea of benchmarking is a bit daunting, remember that not doing it could cost you money. Want help getting started? This article by Ellis can help. Mezzanine Flooring Case Studies — Choosing the right flooring for a mezzanine in your DC can be tricky business. Read these case studies to learn how other DCs have made that choice. Fundamentals of a Workplace First-Aid Program — A good first aid program is an important part of any health and safety plan, according to the Occupational Safety and Health Administration (OSHA). Having a first aid plan in place can help reduce lost-time injuries and help workers recover faster. Get a jump-start on creating your workplace first aid program with this document from OSHA. AC Electric Versus Internal Combustion Forklift Trucks — Should you choose a three-phase AC electric forklift truck or a more traditional internal combustion truck? This whitepaper from Jungheinrich Lift Truck Corp. can help you decide. Nine Signs Its Time to Replace Your WMS — Is your WMS outdated? This whitepaper from HighJump software offers in-depth information on how to tell if you need a new WMS. Tips for a Healthy Spine — Approximately 80-90 percent of the population suffers from spinal pain at some point. People who lift heavy objects are more likely to experience back pain, which puts DC workers at risk. This paper from the American Chiropractic Association can help teach both you and your employees about the importance of having a healthy spine. Lean Readiness Quiz — Are you ready to go lean in your DC? Or are you already lean? This quiz from Lean Cor LLC can help you determine your companys current lean logistics and supply chain management levels. Video Image Detection — Video image detection uses cameras to detect the presence of fire and/or smoke in the DC, providing faster detection times than conventional detectors. Watch this video from axonX LLC to see video image detection in action. Pandemic planning resources — The Centers for Disease Control is continuing to investigate human cases of H1N1 flu in the United States and is working closely with Canada, Mexico and with the World Health Organization. As part of its response to the outbreak, the CDC is issuing new H1N1 flu guidance, now available online. World Health Organization updates — The World Health Organization offers a number of resources and updates on the H1N1 flu virus on its website. Advanced pandemic planning whitepapers — These whitepapers by Regina Phelps, principal of EMS Solutions, offer advice for executives in a number of industries on how to properly prepare pandemic plans. Overcoming the Challenges of Split Case Picking — Learn how to implement automated split case picking solutions in this whitepaper by Diamond Phoenix CEO Tom Coyne. What Is the Storage Utilization Factor? — The Storage Utilization Factor (SUF) is one of the least understood terms in warehousing. As such, it is also one of the principles of warehousing that causes the most operational problems for companies. This whitepaper by Fred Kimball of Distribution Design helps clear up the confusion about the SUF. AS/RS System Videos — Automated storage and retrieval systems can help a DC optimize material flow, reduce costs, and decrease labor requirements. Watch video of an AS/RS in action on the Westfalia website. Taking Difficult Conversations Seriously — Larry Johnson, consultant and author of Absolute Honesty: Building A Corporate Culture That Values Straight Talk and Rewards Integrity, writes about how to discuss those tough issues with employees. Driving Higher Workplace Performance — Bruce Ennis, a Lean Six Sigma Black Belt, was assigned the task of improving warehouse performance for a Western Canadian Industrial Distribution Center. In this article, he tells you how he drove performance improvements on a tight budget. A Warehouse on Wheels — Watch video of demountable containers that allow a DC to load multiple demountable containers on one trailer chassis at night, long-haul them to a regional market on semi trailers, then demount as a low-cost alternative to a regional DC or cross-dock. Sample battery management reports — The EBatt battery management systems use software designed to allow managers to track and improve the efficiency of battery-operated vehicles, including battery-powered forklifts, pallet jacks, high-lifts, and other inventory handling equipment. Download samples of the various reports to learn more about these systems. Directory of dock scheduling software providers — Looking for a provider of stand-alone dock scheduling software? This directory of vendors can help you choose the one that best meets your needs. Consultant in a can — Hempstead Consulting has developed a cost comparison tool designed to let you compare loaded carrier offers. View a sample of the spreadsheet here. Open Source WMS — Want to learn more about open source WMS? Software provider Compiere offers this description of its Compiere Warehouse Management system, built on an open source platform. How much do you know about sleep? — Use the National Sleep Foundations interactive tools and quizzes to assess your own satisfaction with sleep, test your sleep IQ, and educate your employees about the importance of sleep. Receiving Operations and Docks — Looking for ways to improve receiving? This paper from CATTAN Services Group offers information on registering inbound information, analyzing dock requirements, sorting, staging, inspecting, and more. Also included is a template to use as a warehouse inbound shipping register. Logistics Cost and Service Database — Download a copy of Establish, Inc.s 2008 Logistics Cost and Service Database presentation. Online registration required.